Who are we? A technology club and social space for open computing and electronics, every Monday evening. What kind of computing and electronics? Everything from coding (e.g. Python), to website development, to hobby electronics like flashy LED lights and robotics, to computing related hobbies such as photo editing and music, to more technical aspects such as databases and Linux servers. We can demonstrate the absolute basics of these, understandable for anyone interested, up to intermediate and expert level. We use and advocate desktop Linux and FOSS. We welcome all ages, backgrounds and skill levels from beginner to expert; the only requirement is an interest in the subject. If you are a beginner, we would like to try and demystify the subject – you use computers every day, why shouldn’t you understand them? Our members are a collection of hobbyists and Computing professionals alike. 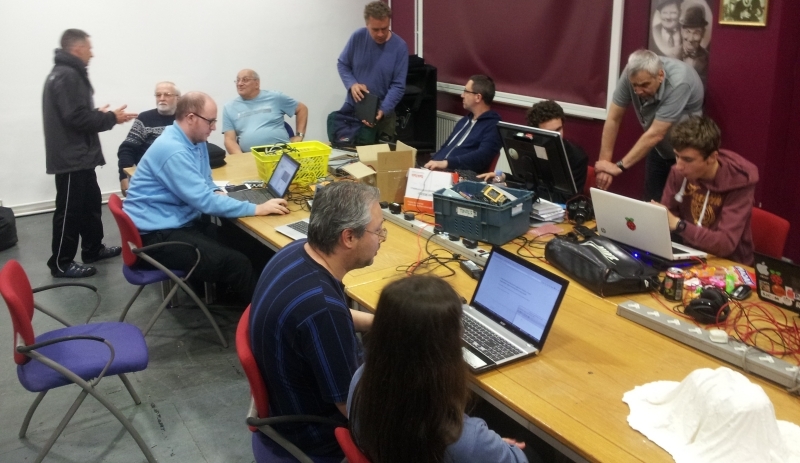 We have run Computing events such as our Southend Raspberry Jam event days. You can read about them here and here. You are welcome to come along to any of our weekly meetings. The format is informal and it’s an opportunity for members, and non members alike, to discuss various topics of mutual interest, and our skills range from novice upwards, so you don’t need any particular computing skills to join in. We are an Association with an annually elected committee and Articles of Association which lays out our aims and rules. Below are some of the latest updates to the site. The articles are written by the SoSLUG members themselves, in order to share their experiences, or expertise, and generally promote the advantages of FOSS. We’re back! Due to the demise of our server, we have taken the opportunity to accelerate a behind the scenes program to move, and update the website. Consequently a few things may still be a bit ragged around the edges, as we work through a few remaining issues. Learn about Computing, including Linux, Free & Open Source Software (FOSS), Raspberry Pi, Python or Arduino or would like help with some particular computing related problem. Improve or share your computing skills with others. We are teacher, educator and family friendly; you may wish to improve your Computing knowledge and skills which are now compulsory for every child to learn in the wake of the recent Computer Science school curriculum. Get involved in, or start a practical project, either in collaboration with other local community groups, or join a SoSLUG project, such as the latest craze for Raspberry Pi’s, wrestle with Python (programming), or web design. Or maybe just pursue a hobby such as photo editing, music etc. As more and more jobs are becoming automated by machines, a trend that will continue to expand, you may wish to learn some Computing skills, to get ahead of the curve. Simply meet up and socialise with others who share a common interest in computing or electronics. Everyone is welcome, both members and non-members and of almost any age. It tends to be a nice mix of regulars, irregulars and some new faces. You can attend for free, but if you would like to get more involved, then our annual membership is just £24. Whilst we would welcome your support, membership is not mandatory, especially if you have limited funds.